obviously, a completely inaccurate statement). The Rule: 5.09(a)(11) (2014 OBR Rule 6.05(k)) states that a batter is out when, "In running the last half of the distance from home base to first base, while the ball is being fielded to first base, he runs outside (to the right of) the three-foot line, or inside (to the left of) the foul line, and in the umpire’s judgment in so doing interferes with the fielder taking the throw at first base, in which case the ball is dead." The rule's comment clarifies what exactly is included in the running lane: "The lines marking the three-foot lane are a part of that lane and a batter-runner is required to have both feet within the three-foot lane or on the lines marking the lane." As the first base bag is physically located in fair territory, the BR is allowed to exit the three-foot running lane "in the immediate vicinity of first base for the sole purpose of touching first base." Essentially, the lane and first base share only that portion of the foul line marked by the white painted line ("chalk line"). to comply with the lane restriction of the rule. 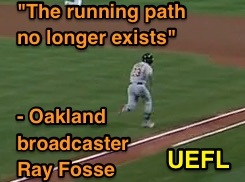 The Interpretation: Jim Evans addresses a key exclusion of the exiting-the-lane courtesy afforded to runners in the immediate vicinity of first base: "A runner who has advanced the entire distance from home plate to first in fair territory making no effort to run within the lane is not extended the same leniency as the runner who runs in the lane as required and then cuts into fair territory near the base to touch it." Wendelstedt discusses quality of the throw: "The determination is not whether the throw is true, but whether it could still reasonably retire the runner." Comment: RLI only occurs when B1 interferes with the fielder taking throw at first base (usually first baseman F3 or, if a bunt, second baseman F4). It is the responsibility of the fielder making the throw (usually catcher F2 or pitcher F1, possibly F3 or F5 on a bunt, etc.) to ensure that the throw could reasonably retire the runner if not for the potential interference. If the throw cannot reasonably retire the runner, it is not RLI. Jurisdiction: Though either the home plate or first base umpire may technically make this call, the plate umpire has primary responsibility for actions of the batter-runner, including possible RLI. 8/17/15: MLB Ejections 164|5-Knight (Fuld, Melvin). 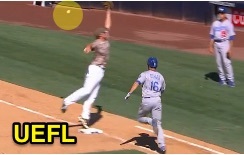 In this pair of ejections, B1 Sam Fuld bunts a ball to F2, whose throw to first base hits B1 and is not caught by F3. PU Knight ruled B1 Fuld ran outside the lane in fair territory, and in doing so interfered with F3 taking the throw at first base. (QOCY. Replays indicate...Interference [BR out of lane entire distance to first base, reasonable quality throw]).